Afghanistan's first trade convoy is set to leave for Europe through Lapis Lazuli route on Thursday. The convoy will carry 135 tonnes of commodities. 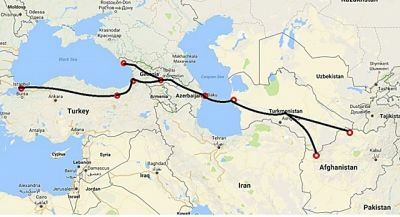 Ariana News Agency- The route begins in Aqina and Turghundi ports in the Afghan provinces of Faryab and Herat and crosses Turkmenistan, Azerbaijan, Georgia and Turkey. It involves road, rail, and maritime transport. The convoy of nine trucks will leave following an inauguration ceremony in the border province of Herat that will be attended by President Ashraf Ghani. The first convoy will carry 83 tonnes of cotton string, 23 tonnes of raisins, 26 tonnes of watermelon seeds and 2.5 tonnes of sesame, said Ajmal Hamid Abdul Rahimzai, deputy minister of industry and commerce. Shah Hussain Murtazawi, deputy presidential spokesman, emphasized on the importance of the corridor saying it is cheapest and shortest route. “The corridor opens markets for our traders and products. Fortunately, we have many different types of products from pine nuts to saffron and even mineral products,” he said. He said that Afghanistan could also import products via the route at cheaper prices and that the corridor would help increase Afghanistan’s transit revenues. The Lapis Lazuli corridor agreement was signed by the five nations in Turkmenistan last year.